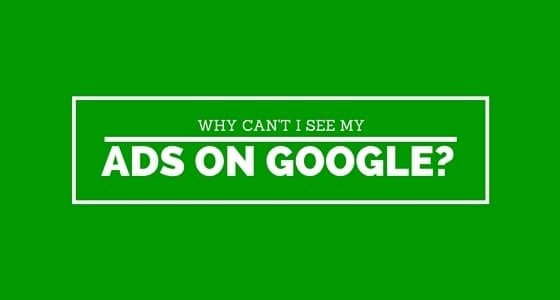 Have you wondered why your AdWords ads aren’t showing when you do a search for your own keywords? I don’t recommend you search for your own ads as this will increase the number of impressions and when you don’t click the ad – which you most definitely shouldn’t, this will cost you money! – your click-through rate (CTR) will decrease, lowering your Quality Score and raising the amount you pay. It’s a vicious cycle. Are within the location you are targeting? Are you searching during the time of day or day of week you have set for your ads to show? Doing a little basic math, this means you are allowed 20 clicks per day. Google examines how often your keywords could match to the average number of searches per day. They also factor in your expected CTR. CTR is shown as clicks / impressions (in percentage form). If your ad is shown 100 times and clicked 10 times, that’s a CTR of 10%. Let’s say there are only 200 searches per day that could match your keywords, then Google should show your ad every other time a search is made. You should get 20 clicks and be charged $20. However, Google gets tons of searches every day. Even for relatively obscure terms, there could be hundreds or thousands of searches that could match your keywords, especially for the less restrictive keyword match types. 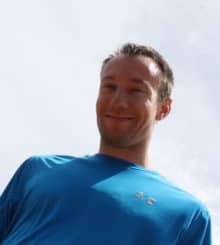 In the above example, even if there were only 2000 searches instead of 200, with a CTR of 10% you could receive 200 clicks in a day (allowing you to raise your budget to $200 /day) if your ad was shown for every search. This means Google can only show your ad once in every 10 searches. If there were 20,000 searches per day, your ads could only be shown once in every 100 searches. Choose Competitive metrics and select the top option: Search Impr. share. 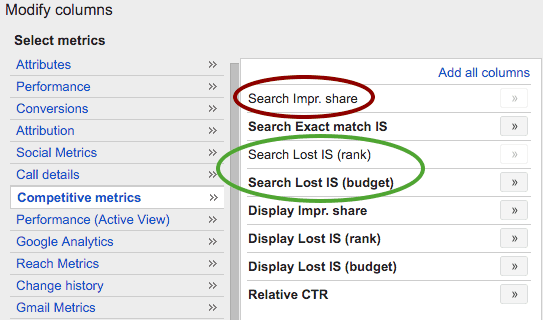 You can also see why you are losing impression share by choosing Search Lost IS (rank) or Search Lost IS (budget). If your Impression Share is not very close to 100% then your Ad is not being shown for every matching search. If Impression share is below 75% I would try to figure out why. 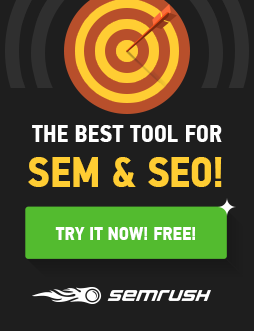 How can you get your ads to show more often? Increase your daily budget, if it makes sense. Remove keywords. The more keywords you have the more searches you will match to, so pausing or deleting keywords will allow those remaining a greater share of the budget. If only 2 or 3 are left per ad group, that’s OK. Stick with the best performing keywords. Show your ads less often. You want to show your ads during periods of time when people are more likely to take action. If you found performance is lacking during overnight hours, simply restrict your ads from showing then. Along those same lines, if you can’t afford to show ads all day, it’s actually better to show them for just during your best performing times. For example, only show your ads during business hours (9am – 5pm). You can also schedule by day of week. Is weekend performance worse than weekdays? Stop showing ads on Saturday and Sunday. Keep in mind, the example above is simplified for ease of understanding (I hope!). Ads are not shown in a basic “once every 10” pattern. AdWords dynamically shows ads throughout your scheduled display criteria to try and hit your daily budget. Sometimes you might see your ad every time you search, while other times you might not see it at all. Once again, it’s important not to search for your own ads because your own searches will negatively affect how often your ads are shown. Instead, you should use the Ad Preview Tool to see if your ads are showing and how they look.